The brownies are good – chocolatey and chewy. The frosting is delicious, especially with the addition of the melted caramel. In a medium saucepan, melt the chocolate and butter together over low heat. Remove from heat and with a rubber spatula, mix in sugar, egg, salt, flour and vanilla. Prepare a 12-cup mini muffin tin by spraying it with baking spray. Using a teaspoon, put 2 teaspoons of batter into your hand and roll into a ball. Place the ball into one of the muffin cups and press down slightly to fill. Repeat until all of the cups are filled. 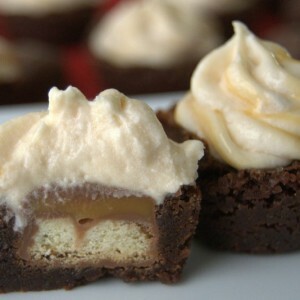 Upon removal from the oven, gently place one TWIX® Bite into the center of each brownie, pushing down so that the brownie comes up around it. Allow to cool in the muffin pan for 5 minutes before removing to a wire rack to cool completely. Repeat process, spraying muffin tray each time before filling with batter. In a stand mixer with the paddle attachment, cream together the butter, cream cheese until smooth. Mix in the chocolate extract and salt. Blend well. Gradually add 1 cup of the confectioners' sugar, followed by one tablespoon milk. After thoroughly mixing, gradually add the second cup of confectioners' sugar followed by the remaining tablespoon of milk. If the consistency of the frosting is too dry, add a touch more milk. If too wet, add a touch more confectioners' sugar. In a microwave-safe bowl, place the 8 caramel and 1 3/4 teaspoons milk. Microwave for 30 seconds. Remove and stir until caramels are completely melted and mixture is smooth. Drizzle the melted caramel into the frosting, folding with a rubber spatula to blend. Do not over mix, you want there to be caramel ribbons throughout.